Purpose of the trip today was to start teaching my son, Parker how to fish with a fly rod and flies instead of frozen hot dogs which was his primary bait up to now. Although he’s only 6 (almost 7) he is extremely interested in fly fishing and watching me tie flies so with my crazy passion for this rod waving sport, he’s bound to be an Anglerwannabe Jr soon. 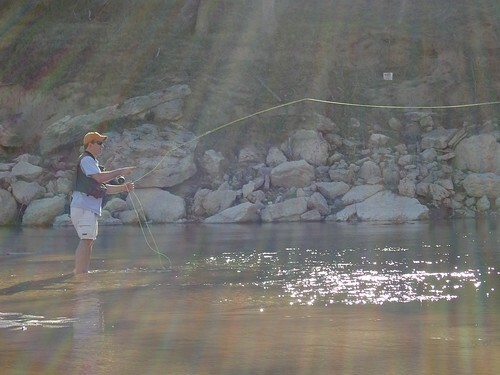 After church, we packed up the Pacifica (or ugly boat as my 18 yr old calls it) and drove the 15 minutes over to Reimer Ranch to practice on the Pedernales River. The weather was sunny, a bit windy and in the high 70’s. Absolutely beautiful Sunday for spending time outdoors. Parker did great learning to rollcast. It won’t take him long. 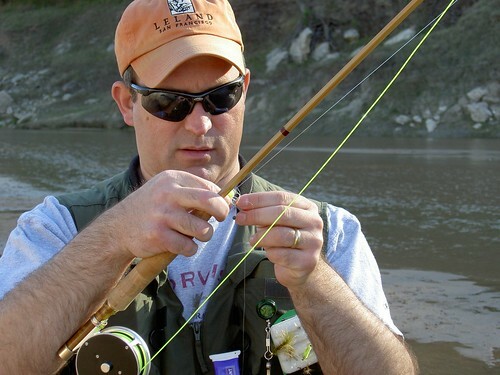 We used a 5′ 3wt rod that I picked up in VA years back. It’s not the easiest rod to cast but the length was ideal for his height. Here are some pictures of the lessons (taken by my lovely wife, Brittany). He lasted about 15 to 20 minutes. 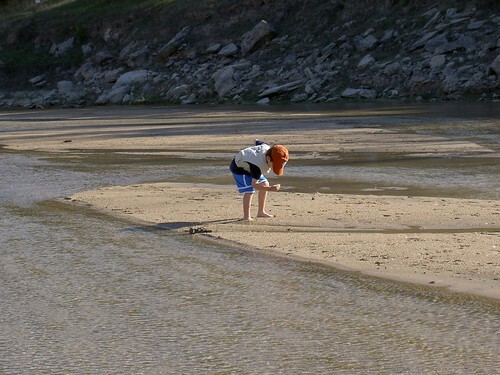 After that, he was a bit more interested in finding things in and around the water. Brittany gave it a shot a few times, but with the mismatch of the conehead wooly bugger I tied on after Parker’s lessons, and the gusty wind, she had a difficult time casting it more than about 15 feet. Although I tried to help, she’s a bit stubborn and claimed she already knew how. 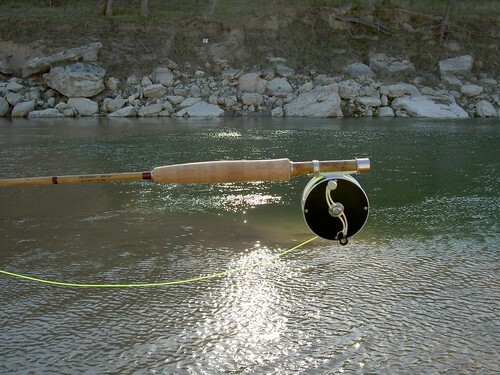 Best to let her think that and go get my Headwaters Bamboo rod and my newly arrived classic reel and have fun myself. Brittany took some pictures of me casting the rod, but the loop / casting form is soooo bad that I’m embarrassed to post them. Here is the result of one of the casts……. A complete and total, um, windknot. We had a good time and I’m so thrilled that Parker and I can share this sport and obsession. 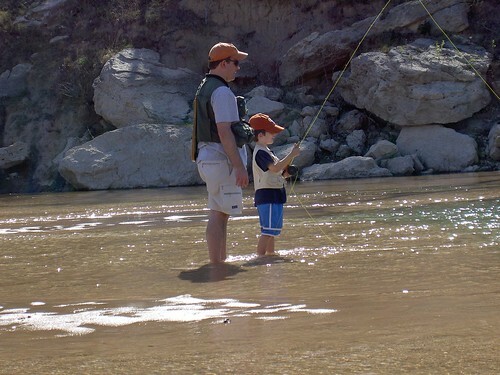 BTW, if any of you have little ones who are interested in fishing or better yet, fly fishing, check out the new site for kids by Trout Unlimited. I just signed him up for TU Stream Explorers membership. I think he’s going to love it. I have lot’s to blog about coming up in the near future as I’m almost finished with At the River’s Edge book and I also picked up “The Drift” last week and have watched it 3 times already. Reviews are coming soon. I also went in to Sportsman’s Finest on Saturday and picked up “The Fly” which is a book about fly fishing history. I’m a sucker for fly fishing history. Have a great time on the water this week.